It was a beautifully sunny day and I had a day off in London. My housemate and I had a dim sum cookery class in the evening (more on this soon) so we decided to have a day wandering around in the sunshine. Our day began in Hoxton at The Friends of Ours. You know me well enough by now, I am a self-confessed breakfast/brunch enthusiast. It's probably one of my favourite things in the world. NOTHING starts the day off better than a good breakfast or brunch to awaken your body! I need to say now, The Friends of Ours serve the best brunch I've ever eaten. EVER! Yes, that good. The Friends of Ours is an Australian inspired café hosting the most fantastic menu for breakfast, brunch and lunch. Better yet, the menu is seasonal meaning all of the ingredients are super fresh, great quality and it's exciting y'know! What tastes better than seasonal ingredients? Not a lot! In true foodie fashion, I'd scoped the menu on the train journey down and already decided what I was having. 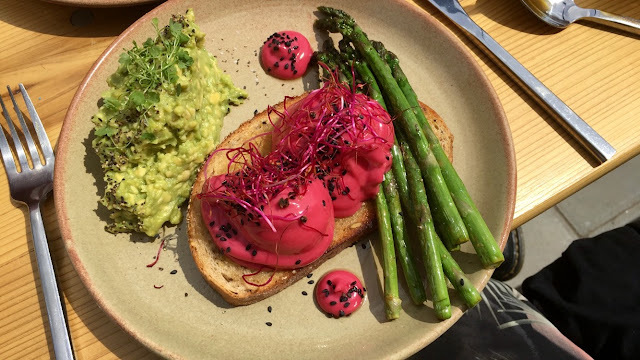 I went for the Eggs Asparagus - seasonal baby asparagus, 2 poached eggs, beetroot and lime hollandaise, black sesame, beetroot sprouts. I had it on sourdough rather than seeded toast and asked for a bit of smashed avocado on the side. Cherilyn went for Eggs Royale - lime cured and green tea smoked salmon, beetroot & lime hollandaise, 2 poached eggs, black sesame, beetroot sprouts on seeded toast. Whilst waiting I had a beautiful Oat Milk cappuccino and an orange juice. I'm known as two drink Tasha, usually when hungover but I struggle to be out without having a couple of drinks with my meal. Odd behaviour, I know. Cherilyn went for the purple juice which was really delicious. I'd never been too keen on the idea of beetroot in a juice after my awful juice cleanse experience BUT it was really good and it's made me rethink that whole idea. Genuinely, and I cannot find the words the express this enough, this is THE BEST brunch I've ever, ever eaten. The beetroot and lime hollandaise is probably the nicest thing I've ever tried. The sesame seeds just made the dish completely. I cannot fault it one bit. Cherilyn felt exactly the same. It really is that beetroot hollandaise that hits the spot! We also shared the Granola, Fruit and Yoghurt, which was way more exciting than the name states - hibiscus flower and yoghurt panna cotta, cardamom granola, strawberries, baked forced rhubarb, pomegranate, hibiscus syrup. Again, out of this world. The granola is the most flavoursome delight and the panna cotta feels so light and tasty. The baked rhubarb left us making 'mmmm and ahhhhh' noises. I actually feel like I'm completely over-passionate about this place but it's always very exciting to find a place by chance and it be so good. Not only was the food incredible, the staff were all SO lovely. All of them were chatty, helpful and seemed genuinely interested in each group of customers that were eating or drinking there. As you can tell, this place can't do any wrong in my eyes. And, you know what? It left me feeling happy for the rest of the day. Definitely head down if you can, they don't take reservations though so it may be a tad busy at the weekends.